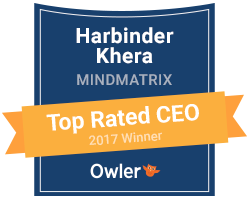 Mindmatrix Founder and CEO, Harbinder Khera, has been ranked #5 in Owler’s list of top-rated CEOs for Pittsburgh. This was the first ever annual 2017 Top-Rated CEO Rankings report by Owler, a leading community-based business insights platform. Owler’s 2017 Top-Rated CEO Rankings report includes all CEOs with 10 or more ratings spanning across 50 cities and 25 industries. According to Owler, employees, followers, competitors, and other general users of Owler were asked to rate CEOs. Owler analyzed approval ratings of the top 5,000 most-rated chief executives included in their top-rated CEO rankings. Harbinder Khera founded Mindmatrix Inc., in 1998. Starting off with a focus on “solution selling” for manufacturers and their channel partners and direct sales force, Mindmatrix added 3200 channel partners to their eco-system in one year. Mindmatrix then expanded to cover new industries, including real estate and franchises. By 2002, Mindmatrix had over 750 real estate companies and franchises with over 30,000 agents worldwide using Mindmatrix solutions. In the last 19 years, the company added to its client and partner base, opened new offices, increased staff, and introduced exciting new features and service lines. Today, Mindmatrix is a leading PRM, marketing automation, channel and sales enablement service provider and the only company in the marketplace that offers a single, fully integrated platform offering complete sales and marketing enablement for direct and indirect channels. The founding principle, “Helping companies sell more”, is still the focus today. Mindmatrix is the only single, fully integrated platform offering complete sales and marketing enablement for direct and indirect sales. Mindmatrix combines PRM, Channel Marketing, Asset Management, Sales Enablement, and Marketing Automation for the complete enablement of your sales and marketing teams. This unified platform takes you through every step in the sales process from lead to revenue, enabling your sales channels to sell more, faster.